Thank you for the Joy to the World piece. The artwork you do is simply stunning! Absolutely perfect! The crystals were the ONLY way to go. They make the print POP. It came super fast and was packaged very well. We LOVE it! Stand tall. Wear a crown. Be sweet on the inside. Hi! My name is Laura Bell and I live in sunny Arizona with my husband, Ryan! Art is my passion and everything I create is made with love and incredible attention to detail. You won't be disappointed! Hi! Thank you so much for being here! Please message me with specific questions. Once full payment is received, I will get to work on creating your order for you. *If a package says delivered when clicking on the tracking information, I cannot accept responsibility for you not receiving it. This would be an issue solely between you and your post office and I am unable to intervene in any way. If you are concerned about this, please purchase shipping insurance. Any claim would be an issue solely between you and the USPS and I am unable to intervene in any way. *Please double check your address and make sure you don't have any forwarding addresses where your package could end up to by mistake. *In the extremely rare case that a package ends up lost in transport, I cannot be held responsible. If you are concerned about this, please purchase shipping insurance. Any claim would be an issue solely between you and the USPS and I am unable to intervene in any way. *First Class International shipping DOES NOT include tracking. If you would like tracking, please upgrade to Priority International. If you would like to add shipping insurance, please send me a message and I will create a listing for you to purchase. If you have any questions at all, please message me and I will get back to you as soon as I can. I'd like something I don't see in your shop or a different version of something you do have - can you create it for me? YES! I live for creating pieces I've never made before! Everything is made-to-order, so anything is possible regarding colors, shape, size, anything! Send me a message and, if possible, please include any photos you have and the size you would like to help me best understand the look you're after. Can you frame for me? YES! When checking out, please let me know you would like to see framing options with your finished piece in the "note to seller". Once your art is ready, I will send you photos of different frame options and prices. 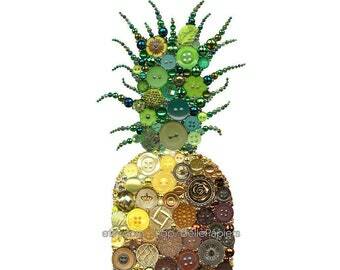 I'd love to own an original piece of Button & Swarovski art, but they're out of my price range - can you create an original within my budget? YES! Please send me a message with what you have in mind and what you're able to spend. I will get back to you with different options to fit your budget. Most of what you see in my shop can be done with less detail, which can significantly reduce the price. I need to receive my order ASAP - are you able to ship sooner than the specified shipping range? YES! When checking out, please let me know the date you need your art in the "note to seller". I am happy to work as quickly as possible (without loss of quality, of course) to ensure you have your item ASAP! I am ordering as a gift, can you include a note? YES! When checking out, please let me know what you would like the note to say and I will include it free-of-charge. I will also leave out any invoice or pricing information. I have very specific colors in mind - can you match them? YES! The best way to ensure I have a clear idea of your exact color(s) is to do an image search for each color you need. Once you find your ideal colors send me those images and I can match perfectly.